A top US lawmaker and former Republican presidential candidate has sent warning to Israel against moves by Prime Minister Benjamin Netanyahu to notch a deal with Russia to remove Iranian forces out of Syria. Russia has been since 2015 Syria’s top power protector and has helped turn the tide of fighting in the civil war that ravaged the regime of Bashar al-Assad since 2011. 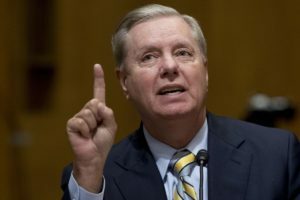 Senator Lindsey Graham of South Carolina Twitted Thursday that he does not believe in Putin for a serious deal to keep Iranian troops and any other forces out Syria. “To our friends in Israel — be very careful making agreements with Russia or Syria that affect US interests,” he said. “I don’t trust Russia to police Iran or anyone else in Syria. US must maintain presence in Syria to ensure ISIS doesn’t come back and to counter Russia/Iran influence,” he added. Prime Minister Netanyahu has been pressing Russia to push for withdrawal of Iranian forces that are propping the embattled regime of President Bashar al-Assad. Netanyahu, on a visit to Russia Wednesday, indicated that Israel is adamant to ensure that Iran leaves Syria. Another Israeli official in Netanyahu’s entourage told reporters Tel Aviv could put up with Assad in power. “Our view that Iran needs to leave Syria is well-known; it is not new to you,” Netanyahu told the Russian President, according to a readout provided by the Prime Minister’s Office. “We won’t take action against the Assad regime, and you get the Iranians out,” Netanyahu was quoted as saying by one of his top officials under condition of anonymity. Graham, a former Republican presidential candidate seems also to direct his comment towards President Donald Trump who is set to meet up with the Russian leader. Ideas that Trump will be trying to seek a deal with Vladimir Putin over the future of Syria including a likely withdrawal of US forces, during their summit in Helsinki, have been floating. Graham believes that a pullout of US forces will be a massive disaster to Kurdish allies, US interests and regional stability. Written by: KanelkaTagba on July 12, 2018. Posted by KanelkaTagba on Jul 12 2018. Filed under Headlines, World News. You can follow any responses to this entry through the RSS 2.0. Both comments and pings are currently closed.